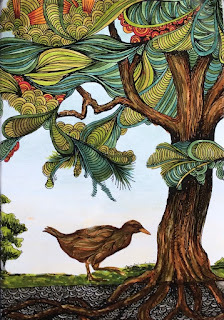 It really is a pleasure to colour our own native birds after all the bright, jungle books with their flamboyant birds. Who will love it - those who enjoy colouring birds, those who want to learn about New Zealand's birds. Comment: I enjoy books that give me so much more than the title promises. 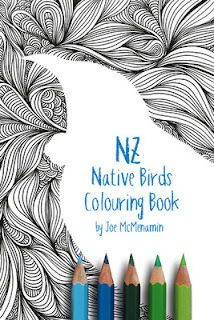 This book really will teach you quite a lot about our New Zealand birds. And it's so relaxing to colour our own native birds with their mostly subtle colours. 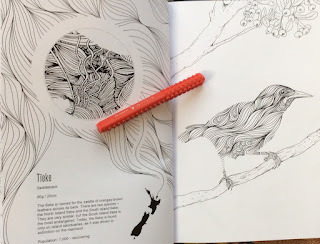 Drawing: The book encompasses drawings of twenty-four NZ native bird species. The birds are either mostly pattern-filled or are cut-outs. 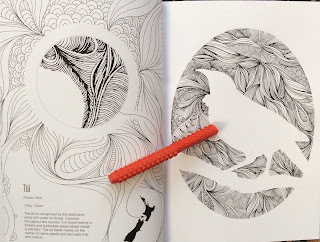 The patterns help give the birds shape and a flowing direction to the feathers. Other images have the birds as cut-outs and you can either leave them as they are, or get creative. Line width is fine to medium and most images aren't too detailed. 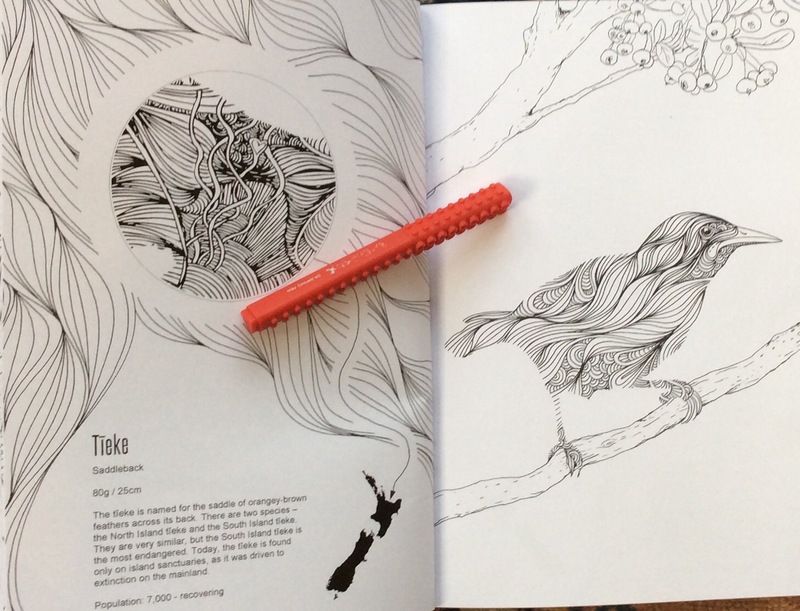 There are no double page spreads in this book, so while some of the background can run into the spine, you won't find birds divided in half at the spine. The backgrounds vary from hardly any to quite a lot, as in the image I coloured above. 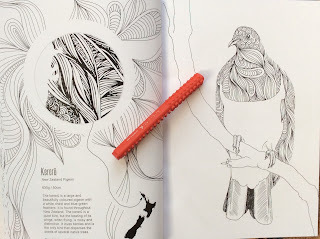 Paper and layout: On each right hand page is a bird image and on the left hand facing page is a patterned highlight from a New Zealand map showing where that bird can be found. There is also an information panel about the bird. The spine is quite tightly glued and stitched. The spine of my book is starting to loosen a little but I'm considering getting it ring bound so that it will lie flat. 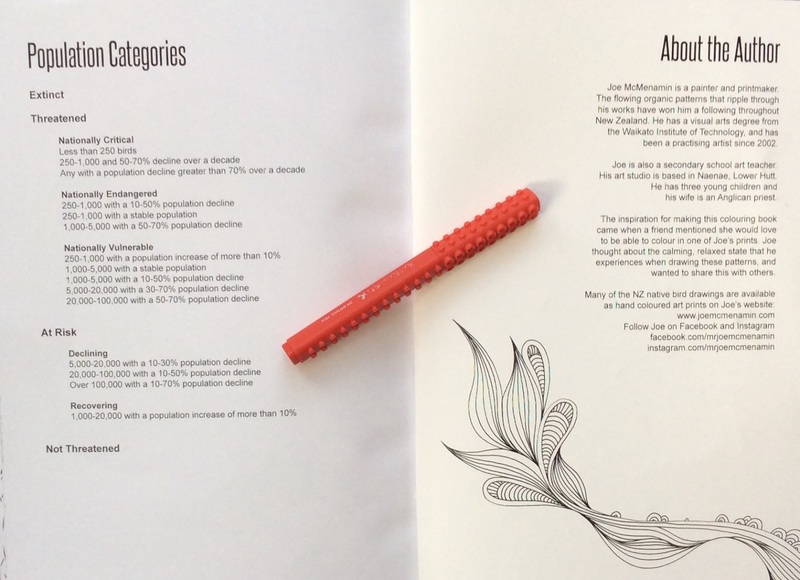 The paper is white, smooth and medium thickness. Test out your pens on an unobtrusive spot first. 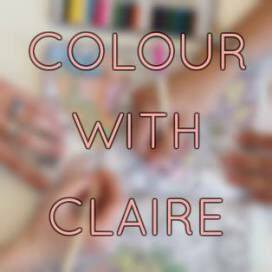 I'd advise putting a sheet of paper or card behind the image you're colouring. If you don't mind bleed through on to the map pages, then alcohol based pens might be okay. At the back of the book is information about the artist, Joe McMenamin, and a table explaining the bird population categories mentioning through the book. 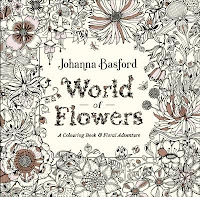 For New Zealanders, you may also find it at Paper Plus and independent bookshops. * This book was sent to me by the artist for an honest appraisal. Thanks.